I found a gold mine. Yes, a gold mine that Facebook built into its tool without making a huge deal about it…therefore not many people are aware of this. But guess what? ​I’m clueing you in right now!! First, you need to find an ad. 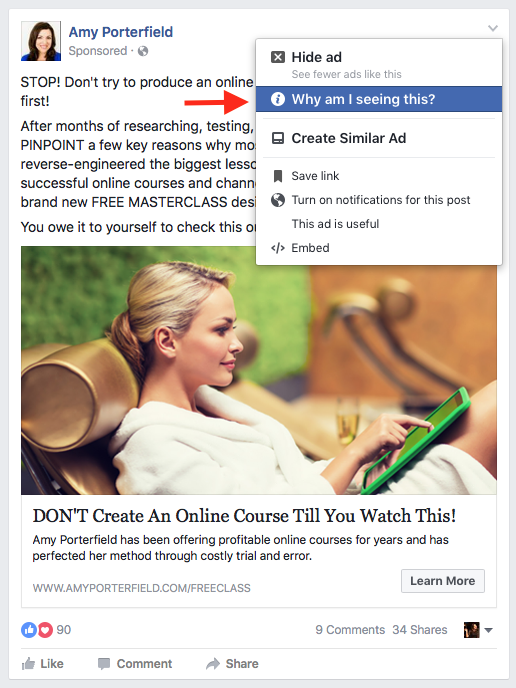 Go to your Facebook newsfeed (mobile or desktop) and scroll until you find an ad. The post will say “Sponsored” (see image below). Now click on the right hand-side arrow. Once you click the arrow, a drop down menu will appear (as shown below). A few options are available to you, but I want you to click on “Why am I seeing this?“. You should be seeing the screen below. Now we are on your way to collecting some golden nuggets! 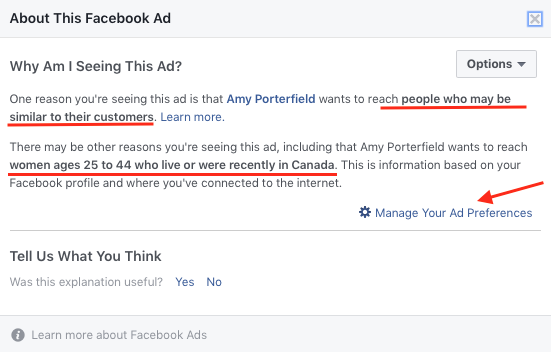 As you can see below, this ad is targeting “people who may be similar to their customers” and “women ages 25-44 who live OR were recently in Canada“. So yes, you can target people based on geography, demographics, interests, actions and more. Why should you care? 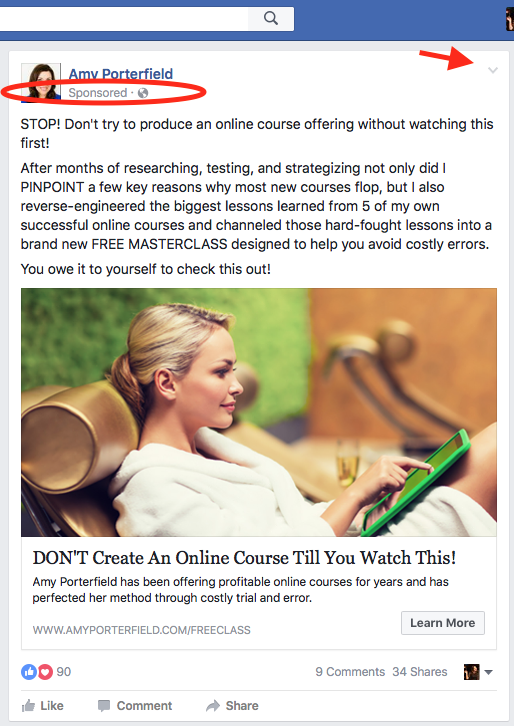 Well, you can spend a lot of money on Facebook ads if you don’t know what you are doing. The market is also getting very competitive on Facebook. And it’s only going to get worst. Why? Because Facebook gets you results. And for some, the results are amazing. But you need to know how to play the game. That’s why I want you to look at the major players and see what they are doing to get great results! I want you to spend your money wisely so this “hidden” tool is a GOLD mine for you! Still with me? Let’s move on. We have more to see! Now I want you to click on “Manage your ad preferences” in the bottom right corner. You will see this next screen below. This is where Facebook ads get very, very interesting. You can target so many things, one of which is “Interests”. 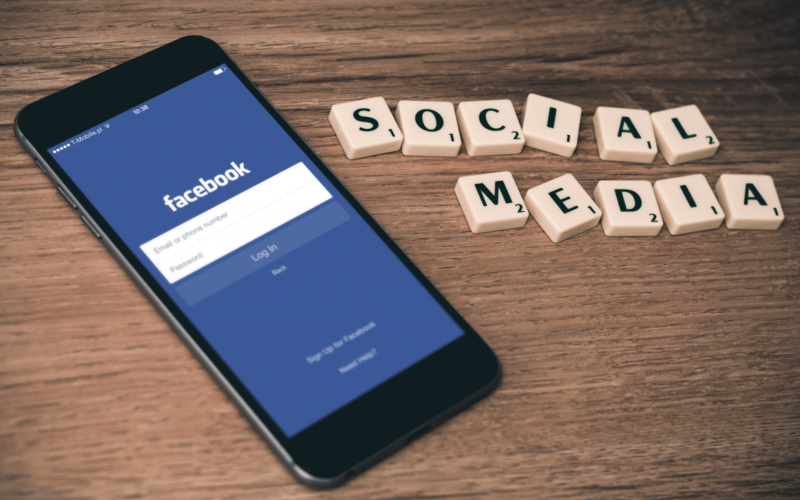 We all have interests on Facebook (yes, you do too!). 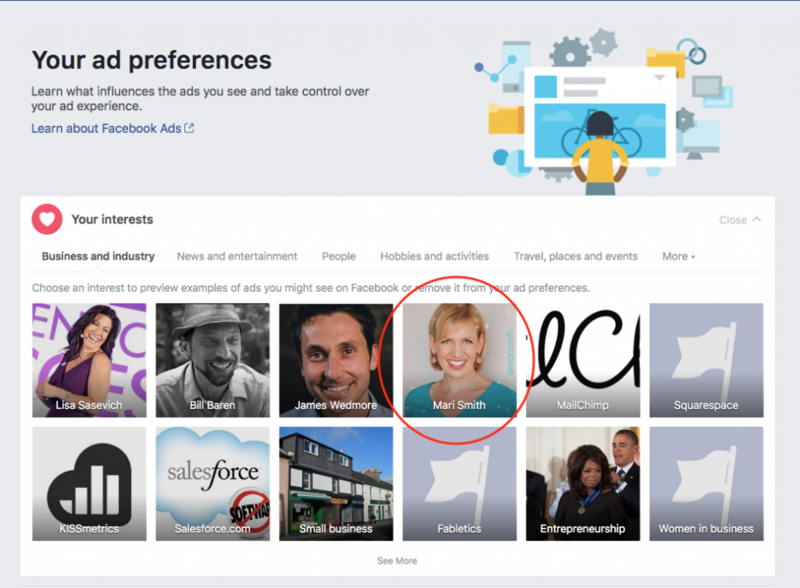 Facebook uses these interests to determine which ads are delivered to whom. So based on your interests (which is only one factor here – there are many more! ), you will see ads that are relevant to you. Now as an advertiser, you want to use this to your advantage and figure out which interests you should use to reach your potential clients! In the image above, you can get a glimpse of my interests (mostly business related! SURPRISE! lol). 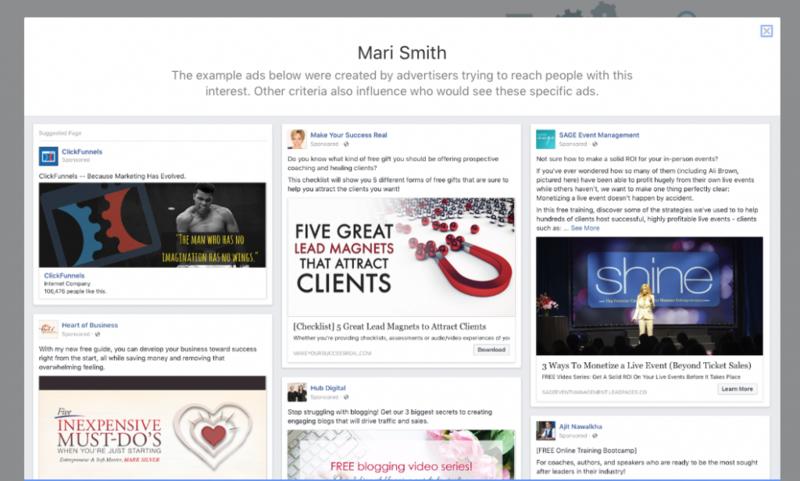 In this screen below, you can now see some visual of the ads that were created by advertisers trying to reach people with this Interests (I clicked on Mari Smith). You can scroll through and see various ads. Time to get inspired!! Study their images, their captions, their description – this is GOLD! Pure gold. You can then go back, click other interests & see different ads. I mean, you can spend quite some time lurking around in here. And yes, all this information is at the reach of your fingertips. And yes, it is totally ethical. Now be the star and share with your friends & peers!